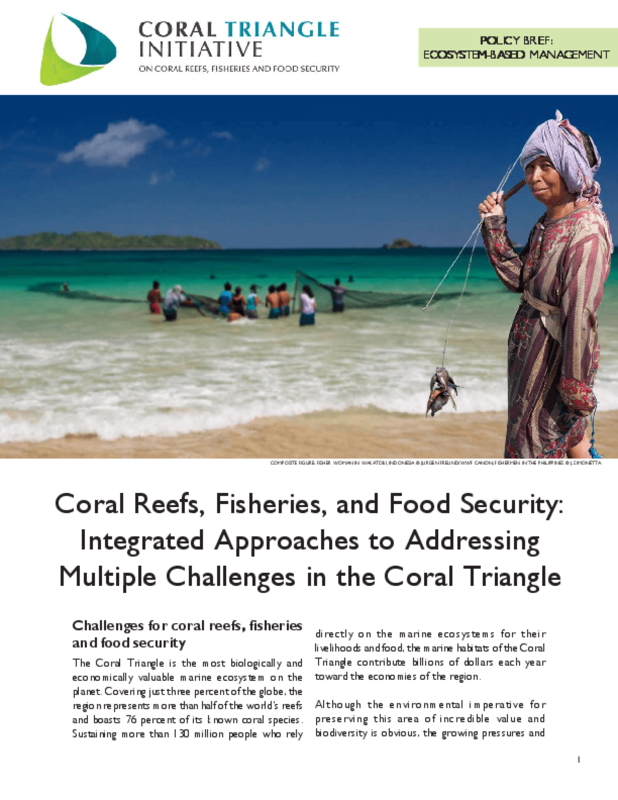 This brief highlights the contribution of wild capture fisheries to nutritional security in fish dependent developing countries. 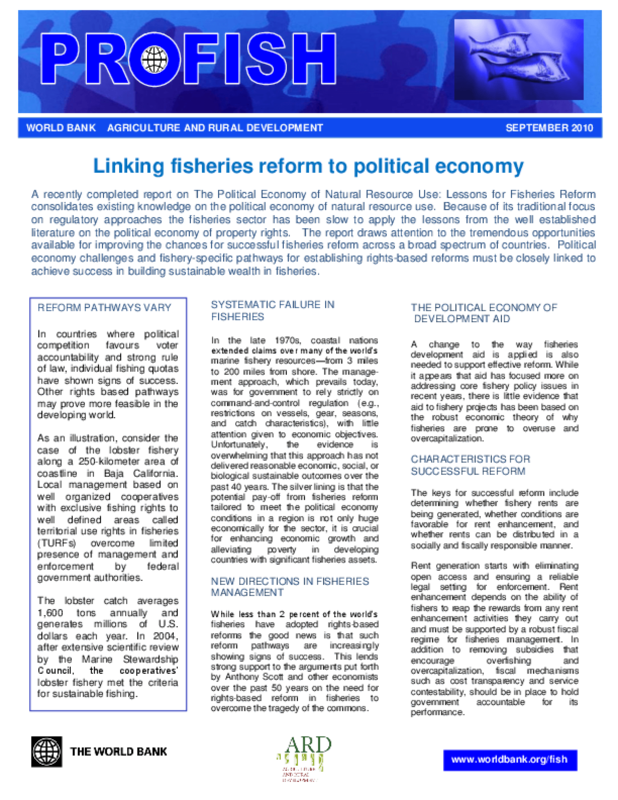 It is intended to stimulate debate around two broad themes: (1) when should the focus of fisheries policies be on local food security and human well-being as opposed to revenue generation, and (2) how does the current research agenda, with its emphasis on environmental and economic issues, assist or impair decision making processes. This Guidance Note presents a simple approach to analyzing the governance context for development of aquatic agricultural systems; it is intended as an aid to action research, and a contribution to effective program planning and evaluation. It provides a brief introduction to the value of assessing governance collaboratively, summarizes an analytical framework, and offers practical guidance on three stages of the process: identifying obstacles and opportunities, debating strategies for influence, and planning collaborative actions. 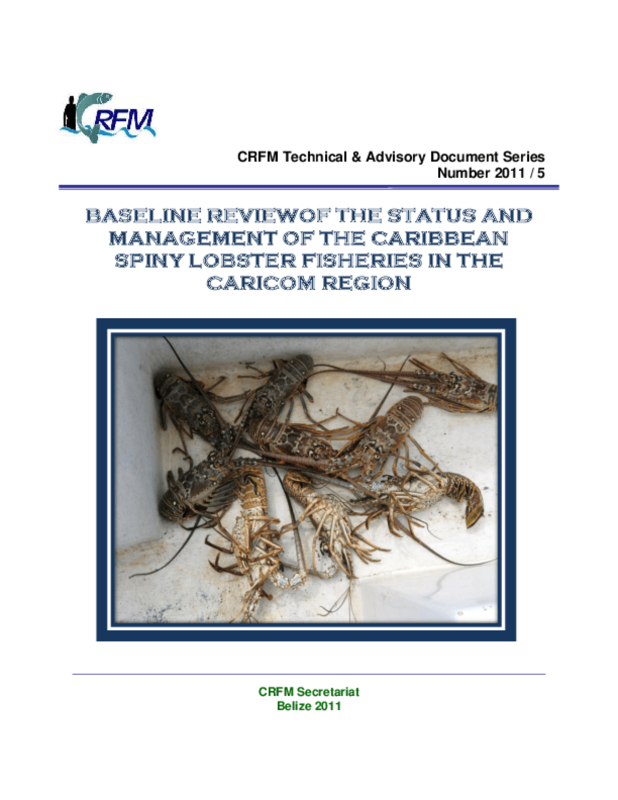 This report provides a review of the status and management of the Caribbean Spiny Lobster Fisheries in the CARICOM region. It provides a general overview of the habitat requirements and threats to survival of this lobster, along with the distribution and population in each country with Caribbean Spiny Lobster Fisheries. Each country's domestic use, international trade, and conservation and management measures are also reviewed. "The 2009-2010 Annual Report of the Climate Change Adaptation in Africa Program (CCAA). 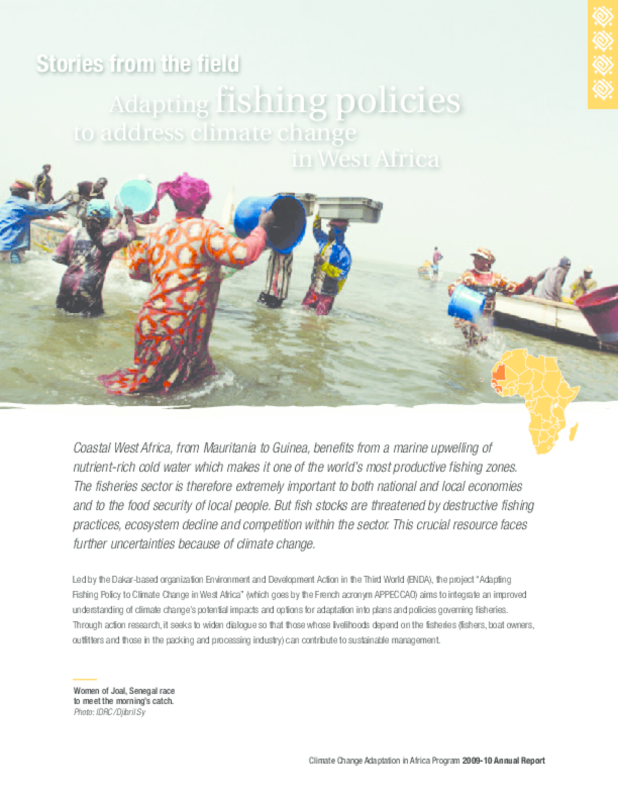 Coastal Africa (Western); from Mauritania to Guinea, benefits from a marine upwelling of nutrient-rich cold water which makes it one of the world's most productive fishing zones. The fisheries sector is therefore extremely important to both national and local economies and to the food security of local people. But fish stocks are threatened by destructive fishing practices, ecosystem decline and competition within the sector. This crucial resource faces further uncertainties because of climate change. Led by the Dakar-based organization Environment and Development Action in the Third World (ENDA), the project "Adapting Fishing Policy to Climate Change in West Africa" (which goes by the French acronym APPECCAO) aims to integrate an improved understanding of climate change's potential impacts and options for adaptation into plans and policies governing fisheries. Through action research, it seeks to widen dialogue so that those whose livelihoods depend on the fisheries (fishers, boat owners,outfitters and those in the packing and processing industry) can contribute to sustainable management." A recently completed report on The Political Economy of Natural Resource Use: Lessons for Fisheries Reform consolidates existing knowledge on the political economy of natural resource use. Because of its traditional focus on regulatory approaches the fisheries sector has been slow to apply the lessons from the well established literature on the political economy of property rights. 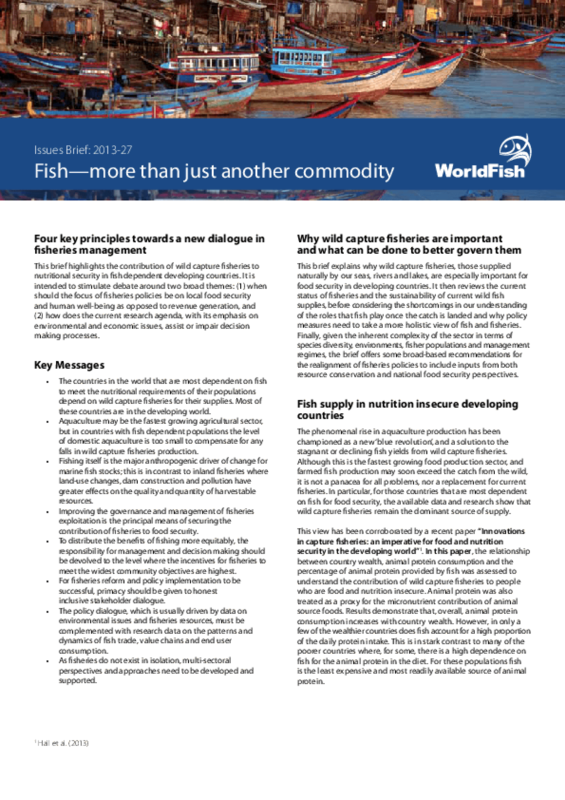 The report draws attention to the tremendous opportunities available for improving the chances for successful fisheries reform across a broad spectrum of countries. 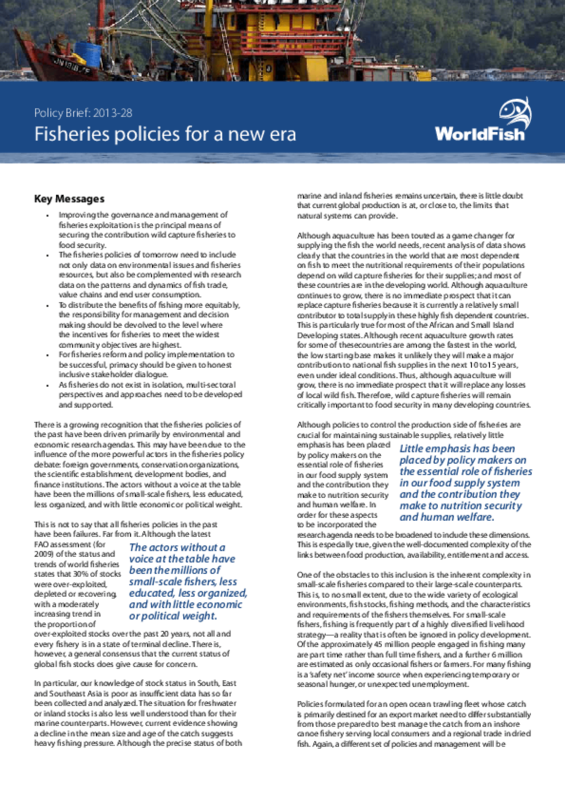 Political economy challenges and fishery-specific pathways for establishing rights-based reforms must be closely linked to achieve success in building sustainable wealth in fisheries. 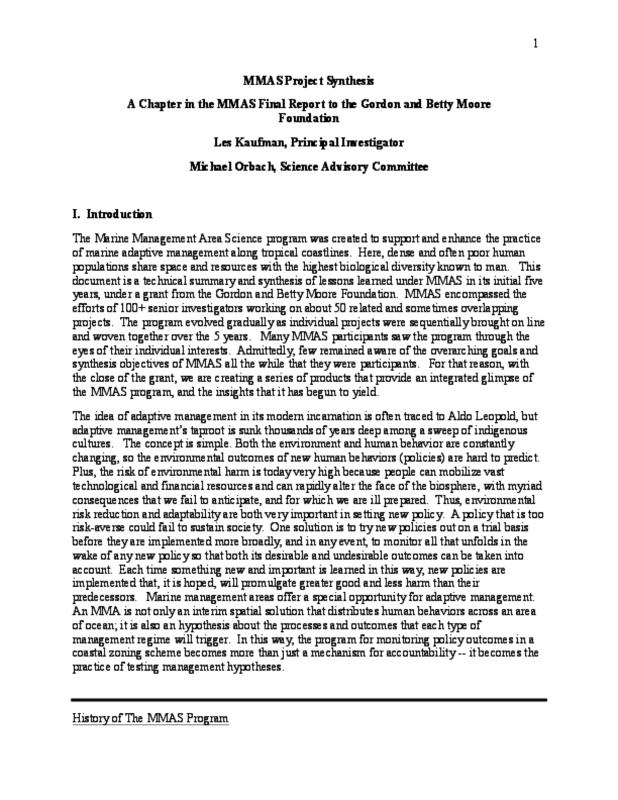 This document briefly addresses key issues explored in that report. 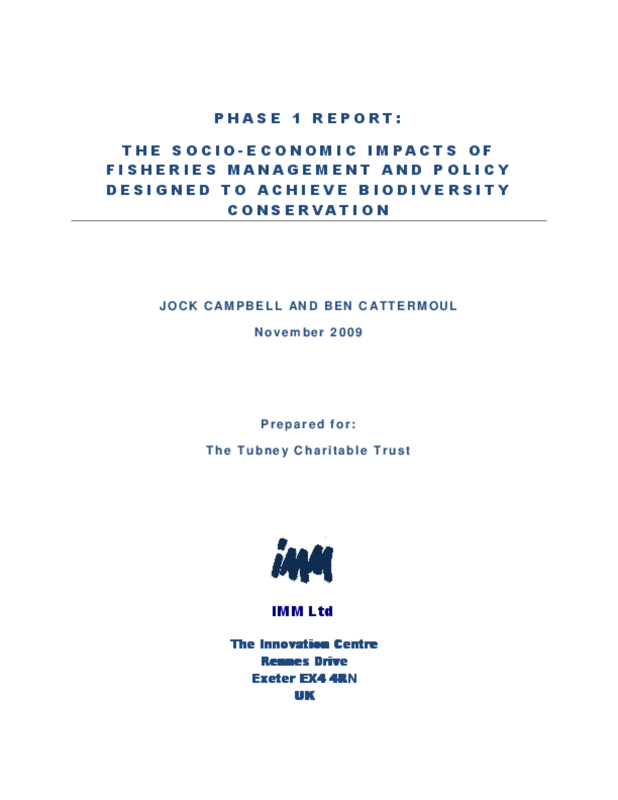 This report responds to a request from the Tubney Charitable Trust to carry out a basic review of current knowledge of the socio-economic impacts of fisheries management and policy designed to achieve biodiversity conservation. The fisheries sector is having a significant impact upon marine biodiversity in UK waters. The report discusses the importance and diversity of socio-economic knowledge and how it can help to place fisheries into the broader, more holistic, framework of sustainable development. It emphasises the complexity of the policy environment and the need to understand the conflicting and contrasting motives of the different stakeholders. Understanding what motivates policymakers and fishers is the first step to changing their behaviour. The report discusses the divergence between policy and policy implementation, and the complexity of policy instruments.